Robert Frank, author of the Economic Naturalist and The Darwin Economy, wrote a piece in the New York Times on the influence money has on determining the outcome of political decisions. Wealthy donors to political causes will want to make sure that policies implemented by the authorities will mean lower taxes for them and less regulation for their businesses. As their income goes up this will only increase the monetary contribution they can give to demand greater favours. Positive – lower taxes mean greater disposable income and more consumption in the private sector. Negative – budget deficits and the reduced quality and quantity of public services e.g. roads, schools, hospitals etc. Frank asks which country would be happier? As improvements to cars are quite costly above a certain value and can be viewed as only minor, most people think that the BMW drivers are better off, not to mention safer. Furthermore the BMW drivers are less likely to feel deprived as societies don’t often mingle. So if regulation promotes a safer, cleaner environment whose benefits exceed those broadly shared costs, everyone – even the business owner – is ahead in the long run. 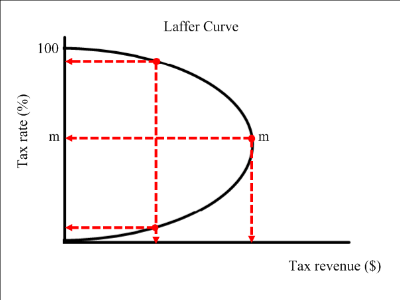 This entry was posted in Behavioural Economics, Fiscal Policy, Inequality and tagged Government Spending, Government Tax Revenue, Tax on November 6, 2012 by Mark. The Swedish Model of how to run your finances. From reading the October 2012 IMF Fiscal Monitor I came across a page on the Swedish model of managing its public finances. Obviously the IMF see this as a good example for other economies to follow. At the bottom of the recession in 2009 the fiscal deficit in Sweden was only 1% of GDP and by 2011 it was at pre-crisis levels. The IMF publication identified four main points that other countries could learn from. 1. The building up of fiscal buffers during good times, together with credible fiscal institutions, provides room to maneuver during bad times. Before the GFC Sweden enjoyed a fiscal surplus of 3.5 percent of GDP, compared with an average deficit of 1.1 percent of GDP among advanced economies. When the recession hit the government had enough fiscal space to allow automatic stabilizers to operate fully and to implement stimulus measures without jeopardizing fiscal sustainability. The fiscal balance went from a surplus of 3.5 percent of GDP in 2007 to a relatively small deficit of 1 percent of GDP in 2009. The authorities’ expansionary policy was not called into question by markets because of the low level of the deficit and the credibility of Sweden’s comprehensive fiscal policy framework—including a top-down budget process, a fiscal surplus target of 1 percent of GDP over the output cycle, a ceiling for central government expenditure set three years in advance, a balanced-budget requirement for local governments, and an independent fiscal council. 2. Central bank credibility allows monetary policy to be used aggressively. During the crisis, the Riksbank lowered its target short-term interest rate nearly to zero and implemented sweeping liquidity measures, including long-term repurchase agreement operations and the provision of dollar liquidity. 3. A flexible exchange rate can help absorb the shock. During the crisis, the krona fell in value against both the dollar and the euro as investors flocked to reserve currencies. It depreciated by 15 percent in real effective terms from mid-2008 to early 2009, supporting net exports and helping prop up economic activity. 4. Decisive action to ensure financial sector soundness is crucial. Swedish banks were badly hurt by the financial crisis, despite their negligible exposure to U.S. sub- prime assets. Bank profitability fell sharply in 2008– 09, and two of the largest banks — both increasingly funded on wholesale markets and exposed to the Baltics — saw their loan losses spike and their share prices and ratings decline accordingly. The authorities took fast action to calm depositors and inter- bank markets, including a doubling and extension of the deposit guarantee and introduction of new bank recapitalization and debt guarantee schemes. This entry was posted in Economic Systems, Exchange Rates, Fiscal Policy and tagged Government Tax Revenue, Sweden on October 27, 2012 by Mark.